It's significant that this politician is lauding this particular corporation's notable accomplishments over the years. Any politician praising any company (and its founder) other than Wal-Mart (NYSE:WMT) would quickly be filed away as a non-story. But because it's Hillary Clinton heaping praise on this company, it's become big news. Hillary Clinton's words may come back to haunt her. Her campaign flagged her speeches lauding Wal-Mart and its founder, Sam Walton, as controversial. Image source: Flickr user Aaron Vowels. Following one of WikiLeaks' data dumps lifted from Clinton campaign manager John Podesta, an 80-page document from her own campaign emerged, flagging comments Clinton made praising Wal-Mart in speeches the public did not previously know about. The campaign thought it might look bad if those speeches became public. The four-page section that caught their eye and caused consternation dealt with the high regard she had for the company and the esteem she held for its founder, Sam Walton. Because Clinton was both a director and a shareholder in the retailer for six years, her relationship with the country's largest employer has always been fraught with controversy. As a separate WikiLeaks email has since highlighted, Clinton has discussed the need for public and private positions in politics, suggesting why her comments about the retailer might not sit well with potential supporters. Here are the five most important things about Clinton's relationship with Wal-Mart. 1. She was the first woman director at the retailer. Clinton detailed how she came to serve on Wal-Mart's board in the 1980s during a speech to research and investment firm Sanford Bernstein. She warmly recounted how she and Walton had previously worked together on education reform and that Walton approached her, saying, ""[M]y wife and daughter think we need a woman on the board and we can't think of anybody else besides you. I said, well, you have a way with words, Sam. That's really flattering. But, sure, I'll be on the board of Walmart." She also served on Wal-Mart's board between 1986 and 1992, which was also a period of tremendous growth for the retailer. 2. She called Sam Walton a "great patriot." In remarks to Sanford Bernstein in May 2013, Clinton extolled Walton's virtues, saying, "Sam Walton was a cheerleader for Wal-Mart but also a great patriot, because he knew that he was able to build this company in this country, and it might not, if ever, have been possible anywhere else." But for some people, Walton's ethics were lacking: he kept wages low; offered few benefits; and was one of the first retailers to heavily import cheap goods from Asia. It could be argued that as Clinton served on the board of directors she supported these initiatives, or at least didn't actively oppose them. For example, activist Ralph Nadar's push for her to support increased wages for women did not elicit a response from the former Senator. 3. She praised Walton for embracing technology early. While many think of Wal-Mart as a stodgy retailer, it's actually a forward-thinking, technologically savvy company that was one of the first large companies to invest heavily in systems we take for granted today. The company was an early adopter of RFID tag technology, universal barcodes as a labeling system, and electronic data interchange -- the transfer of documents electronically -- between the company and its suppliers instead of using paper or fax. In a speech at London Drug Toronto, Clinton said, "They were always thinking about what came next. Yes, they may have started out in small towns and rural areas like Arkansas, but they were always improving their technology." 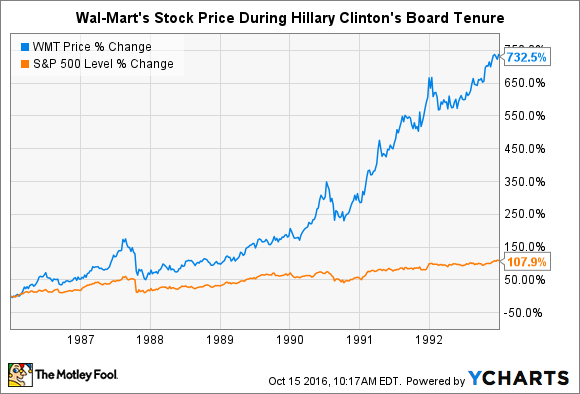 Although many progressives love to hate Wal-Mart, Hillary Clinton considered Sam Walton a visionary and a man who brought positive change to America. Image source: Flickr user Janice Waltzer. But many worry about how those technology advances displace workers. For example, Wal-Mart began experimenting this summer with drones to replace quality control employees while also applying for patents for self-driving shopping carts that can collect themselves, do inventory management, and more. There are 7,000 back-office jobs the retailer announced it also wants to eliminate in favor of "cash recycling" machines and the like. 4. She supported Wal-Mart's burgeoning environmental consciousness. Wal-Mart wields tremendous influence today in the area of sustainability. It diverts from landfills more than 81% of the materials that flow through its stores, clubs, and distribution centers, while the figure runs as high as 90% in Japan and the U.K. It has reduced plastic bag usage by 10 billion bags annually (though mandating paying for plastic bags, as the U.K. did, will have that effect), offers an electronics recycling program, and assists suppliers with sourcing goods responsibly. Clinton credits her efforts at pushing Wal-Mart to consider the environment as a corporate imperative, telling a gathering at the International Leaders Series in Montreal in 2014 that "I think people are starting to get concerned about the environment. And I think we should do a better job in this company in trying to figure out how to have more energy efficient stores, how to deliver goods more efficiently with less use of fossil fuels as possible, and so I chaired the first little environment subcommittee." 5. She praised Wal-Mart for providing jobs, low-cost goods, and expanding the availability of food. To that same London Drug Toronto group, she said people can complain all they want about Wal-Mart, but it's been a good and valuable service for the community. "Those stores -- you know, you don't have to agree with everything Wal-Mart does, I don't -- but those stores served a real purpose, not only for employment and low cost goods, but they did become a way for people who wanted to see what else was available to them could go and look, products that never were readily available in a lot of those places before." Image source: Flickr user Portal Abras. Her base might disagree on the retailer's ability to support community, believing instead that it disrupts it. According the The Intercept, the liberal Economic Policy Institute estimates "Wal-Mart-based trade deficit with China alone eliminated or displaced over 400,000 U.S. jobs between 2001 and 2013." Clinton continues to have close ties with Wal-Mart and the Walton family, and late last year, billionaire heiress Alice Walton contributed more than $353,000 to one of her campaign funds. Her tenure on the board showed her exercising her fiduciary responsibility to Wal-Mart's shareholders, not by being a "change agent," which is not necessarily a role for a director, but by prodding and accommodating the management of a major corporate citizen just emerging on the global stage. That might rankle the voters she is trying to court, but she's not necessarily wrong about the benefits Wal-Mart has bestowed.